The fireworks could begin early in this holiday-shortened but jam-packed week. In the housing sector, Pending Home Sales will be released on Monday, followed by the S&P/Case-Shiller Home Price Index on Tuesday. Look for manufacturing data from the Chicago PMI on Tuesday and the ISM Index on Wednesday. Consumer Confidence will also be released on Tuesday. The first of two key reports on the labor sector will be released on Wednesday with the ADP National Employment Report. Thursday is the big day with the June Jobs Report, which includes Non-farm Payrolls, Hourly Earnings and the Unemployment Rate. Weekly Initial Jobless Claims will also be reported on Thursday, as usual. All U.S. markets will be closed on Friday in observance of the July 4th holiday. 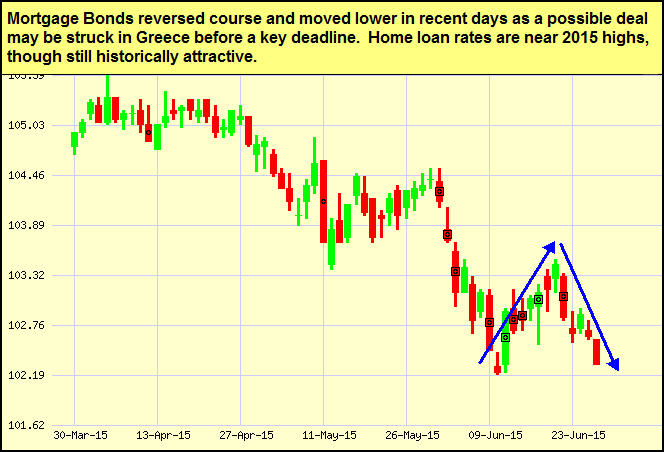 As you can see in the chart below, Mortgage Bonds have struggled in recent days. I’ll be watching closely to see if they’re able to bounce back in the days and weeks ahead. “We are what we repeatedly do. Excellence, then, is not an act, but a habit.” Aristotle, 345 B.C. The myth that people are born talented is evaporating. The scientific community is at last catching up with what even Aristotle knew—the difference between success and non-success, skill and mediocrity, is a matter of dedication and time rather than innate ability. Hard work first. Most experts (and experts who study experts) say that practicing first thing in the morning when you have the most energy is best. Practice intensely, but not too long. Working without interruption for short periods of no longer than 90 minutes with short breaks (and not longer than 4.5 hours each day) seems to be the norm for top performers. Get feedback in small doses. Too much advice too frequently can impede learning and make you gun shy. Focus on your own experiments. Refresh regularly. All work and no play … stinks! And it won’t help you in the long run. Plus, if it’s a breakthrough you want, rest is the best thing for activating your creative right hemisphere. Ritualize practice. Time blocking ensures you don’t have to expend any energy thinking about when or how to work.